Please note that I no longer offer guiding and tuition specifically for grayling from October to March. In my opinion there are no longer the numbers of grayling in the Yorkshire Dales Rivers to make it worthwhile targeting them after the end of the trout season. We can target them to some degree when trout fishing and go through the techniques you'd employ in winter, but there are now so few grayling it doesn't seem fair to charge people and I feel uncomfortable doing so. The Yorkshire Dales are renowned throughout England for the Grayling fishing available on the River Wharfe, River Ure, River Nidd, River Ribble and River Swale. All the above rivers hold grayling but in varying amounts and sizes. Traditionally the River Ure held the biggest stocks of grayling, but in recent years there has been a big decline in grayling numbers on the Ure. The river still holds reasonable stocks of grayling, but it no longer stands head and shoulders above the other rivers of the Yorkshire Dales. Grayling stocks in all the rivers vary from year to year for many reasons. The important thing is reading the river for typical 'grayling water' (one of my blog posts covers this). The Yorkshire Dales rivers provide the perfect habitat for grayling and grayling fly fishing and they extend the flyfisher's year right through the autumn and winter. In effect this only gives us 10 days, from March 15th to March 24th (in North Yorkshire - as seasons vary throughout England) when we are unable to fish the rivers for brown trout or grayling. 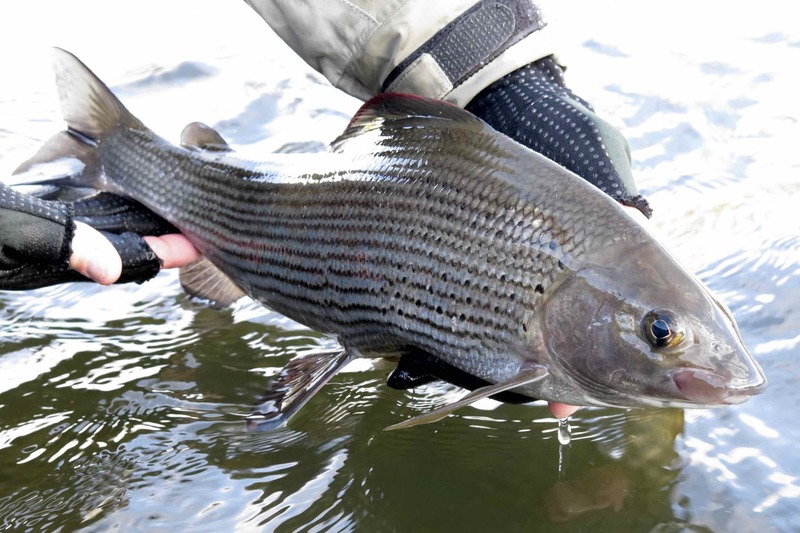 Grayling are caught all year round and a day on any of these rivers, at any time of the year, will usually result in the capture of a few fish. The best time of year for grayling fly fishing is from September to December when they are at their most active and feeding hard throughout the day. The dry fly fishing during early autumn when grayling are rising to aphids and pale wateries can be simply superb, though not easy for the newcomer to grayling fishing because of the speed of the rise, but very exciting and often frustrating. The dry fly fishing tapers off into December when we need to employ other methods to catch grayling on the bottom of the river. There is always the occasional day during winter when the grayling will defy all odds and still rise to a fly, but these days are few and far between. With the onset of the colder winter weather we turn to Czech Nymphing, or 'bugging' as it is also known, Euro/French Nymphing and the 'duo' or 'trio' to get our flies down to 'the zone'. We search every pool thoroughly to find the winter grayling, using rivercraft and experience to determine where they will be lying, but in all honesty they are not usually too far away from their summer lies. Grayling are an ideal quarry for the inexperienced fly fisher as they are more tolerant of an angler's presence than the brown trout; in broken water they can be caught almost under your feet! Unlike the brown trout they will not bolt for cover at the first sight of an angler, but generally move away slowly whilst continuing to feed. The Grayling Society was formed in 1977 by a small group of enthusiastic game fishermen who wished to conserve and establish the Grayling as a true, wild, game fish. Its core aims have remain unchanged - to promote Awareness, Conservation and Angling for Grayling.